Just placing a drawing view onto a drawing sheet is simple enough but aligning the views up isn’t, especially if you want to have the plan view aligning up in the same position on every drawing. 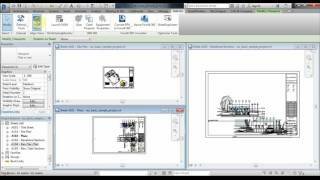 This plug-in will help you with aligning views on many different drawings sheets just in few clicks. Updated to Autodesk® Revit® 2018, 2019. Adding "quick-Align" for the viewports in a sheet. Hi can this be introduced to 2016 by any chance? Awesome App, available in 2018? This App saves me a bunch of time especially when im working in models that i have several hundred sheets in. could we please get a verizon on an update to be able to use it in Revit 2018? Thanks Again! The app is now live for 2018 and 2019. Can't thank you enough... Wonderful time saver. Will you be releasing an 2018 version? Thank you for this add-in! It worked without a glitch! Fantastic, intuitive add-in! Is there also a verson compatible with Revit 2018? Great Revit add-in Are you intending on releasing an Revit 2017 version?